Continuing from the recent quarterback and running back ADP outperformers, we’re moving on the wide receiver and tight end edition. This list of players includes those that have a chance at exceeding their current average draft position with the ability to outperform current players being drafted in the same vicinity. Looking at early Fantasy Football Calculator ADP, there are quite a few names that stand out as immediate value plays. We’re still months away from drafting our re-draft teams, but it’s never too early to start looking at inefficiencies in the market and start formulating a plan to use it to our advantage. Bob Quinn has made it a mission to have a great OL. He has acquired all 5 of the Lions starters. 2018 Offseason: Drafted Frank Ragnow. Last year, Jones commanded just an 18.9 percent target market share. Following the departure of Eric Ebron (86 targets) and the Lions settling for mid-level free agent Luke Willson, Jones’ targets should remain steady with a slight chance of an uptick as those targets get re-distributed. If starting with an RB-heavy approach, Jones makes for a very strong wide receiver candidate (think WR2 with upside) to anchor your lineup around without having to invest more than a late fifth-round pick on him. Piggy-backing off the Jones selection, it’s difficult to argue against going with each of these receivers back-to-back if your draft position is toward the back end of your drafts. 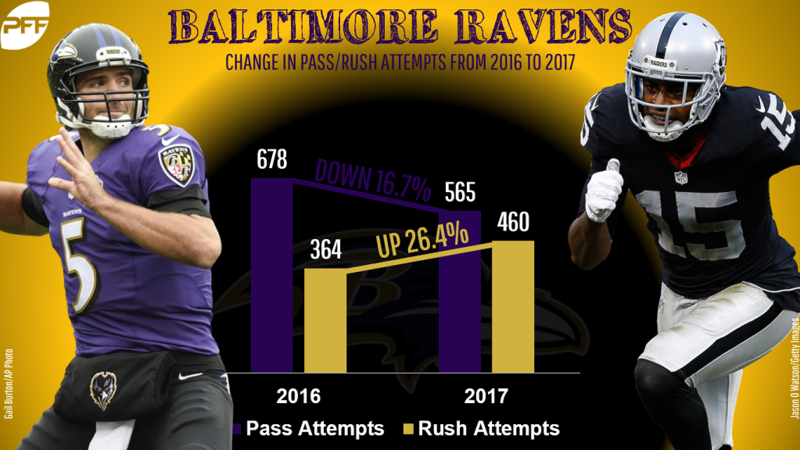 After leading the league in pass play percentage in 2016 (65.99 percent), Baltimore let the run game prevail in 2017 as their passing decreased to just 56.36 percent, 20th-highest in the league. That trend will likely continue in 2018, but it doesn’t mean there aren’t valuable targets up for grabs. In fact, Crabtree enters a Baltimore offense that leads the league in most targets and air yards up for grabs. Over the last two years under OC Marty Mornhinweg, Baltimore’s No. 1 wide receiver (Mike Wallace) averaged over 104 targets per season. Crabtree should be penciled in for at least that amount, as he’s averaged a 136-target, 16-game pace during his past three years in Oakland. Crabtree has also been a prolific red-zone receiver of late, averaging 16.3 red-zone targets per season during his tenure as a Raider. Letting both Wallace and Benjamin Watson walk opens up 25-of-75 red-zone targets available for Crabtree to potentially inherit. If Crabtree can take over a significant role in the red zone, those touchdowns could elevate his week-to-week consistency. Despite the Ravens appearing to head in a run-first direction, the 332 targets leftover from last year and the void in red-zone receivers presents a huge opportunity for Crabtree as a first-year Raven, potentially flirting with mid-WR2 numbers. We have yet to see Lockett hit his true potential. Entering his fourth season and with both Paul Richardson and Jimmy Graham out of Seattle, this could be the year we see it all come together for the former third-rounder. Seattle’s another team that lost a sizeable number of targets from 2017, with 217 available for Lockett and company. Lockett should absorb a good number of Richardson’s departed targets and snaps, elevating his fantasy floor and perhaps evolving past the “boom-bust” label. Given the mass exodus of big-name defenders leaving the Legion of Boom, this Seattle pass offense will often be forced to pass the ball quite often to keep pace in games. Lockett’s 4.40 speed should shine as a downfield separator when Russell Wilson scrambles out of the pocket and forces even the most disciplined defenses to panic and break form. With Doug Baldwin as his only serious competition for targets, Lockett is being far under-drafted and should be a popular “sleeper” tag for many heading into the 2018 season. Watson’s name won’t be called in many standard 12-team drafts, but he could elevate to a hot waiver-wire name sooner rather than later. The Saints released Coby Fleener this offseason and Watson enters a depleted depth chart for the Saints at the tight end position. The last time Watson was with the Saints (2015), Watson finished as the fantasy TE7. Consistently peppered with targets from Drew Brees (110), Watson finished his 2015 campaign with a 74-825-6 stat line. He converted six of his 18 red-zone targets into scores that year. Those 18 red zone targets should have fantasy owners do a double-take, seeing the type of volume Watson had with the possibility of repeating. New Orleans has ranked top-five in red zone trips per game for each of the past five seasons. Watson could quite easily jump right back into this offense as one of Brees’ safety valves and outperform his current TE20 ADP. At the fringe of not registering an ADP worth tracking, Seals-Jones’ average draft position isn’t taking enough future projection into account. Jones played on a limited sample size in 2017 running just 70 routes, but his 2.96 yards per route run would’ve led the field by a sizable margin had he had enough snaps to qualify. To put that number here into some context, Rob Gronkowski sported 2.43 YPRR to lead the position; the next-closest was Hunter Henry at 2.05. During Sam Bradford’s last healthy season (2016), he connected with TE Kyle Rudolph for a career year, putting up an 83-840-7 stat line on 132 targets. Bradford has shown he historically tends to throw short, high-percentage passes over the middle and let his receivers shine in space. Seals-Jones offers both that ability and field-stretching ability, providing this Arizona offense a diverse weapon entering Year 2 of his career. Seals-Jones makes for a strong third tight end candidate in best-ball leagues and could see some early-season success if Bradford holds off rookie QB Josh Rosen.